Two loops left: loop 5 is 21.1 km; loop 6 is 18 km. Maria Alvarez and Nobby leave in first place onto loop 5. 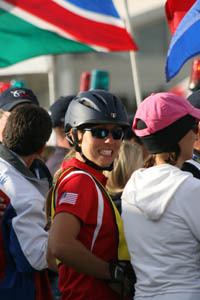 The first 7 riders leave within 3 minutes of each other, including USA's Heather Reynolds and Ssamiam. USA's Deborah Reich and DJB Juniper are in 18th, 41 minutes behind first place. There is a 3 hour difference now, between first place and Chikako Nishiyama, the last Japanese rider left of their group of 5 who started. Argentina's Christian Petersen and RP Sebastopol had moved up steadily all day, from 36th to 29th to 15th to 12th place leaving on loop 5. 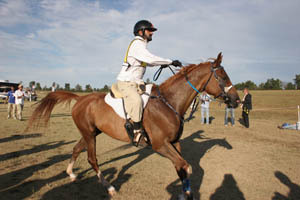 Argentinean Mercedes Tapia and Ras Senor had pulled end of loop 4 because of lameness, but Mercedes was proud of the 8-year-old she rode for clients Clara Leonor and Juan Ithuralde. He'd had a rough van ride from Florida - after the long flight from Argentina - and arrived in Kentucky a bit laminitic. He's a talented youngster with plenty of years ahead of him. And Mercedes loved the ride. "It was beautiful! I realize now what I missed last year (at the muddy Kentucky Cup) in the cold gray rain!" 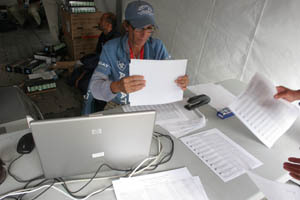 At this time of day, around 5 PM with the leaders starting to arrive off loop 5, and the slowest riders still on loop 3, Vicky the secretary was getting hammered with requests for vet gate results. Her tent corner was the most popular place at the venue. Imagine a continuous crush of 15 people and 30 hands in your face, "Can I have vet gate 3? vet gate 4? vet gate 5? Individuals? Teams? Eliminations?" and Vicky clicking "print" on her computer and retrieving printed piles of papers and stapling them and handing them out fast as she could. She never had time for a break after noon. I think somebody brought her a bottle of water to drink. Someone finally helped her start stapling papers together. I think she ran out of paper at some point, also. Indian Mustafa Tehrani and AF Big Bucks had slowed their pace, from 20 and 19 km/h on the first three loops, to 12.6 on loop 5. 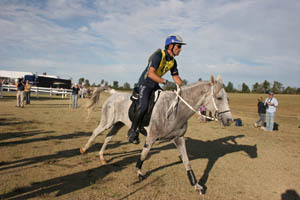 A little tightness had developed in his horse's shoulder after their earlier crash, and after that, Mustafa could no longer push him as fast. "I had to take a calculated position, and just finish," he said later. It was a bit disappointing, because he'd had high hopes to be in the top ten. They left on loop 5 in 29th place, over an hour behind the leaders. Nevertheless, Mustafa was another who was enjoying himself. "I was having fun, all the way," he said later. "I was laughing, joking when I was riding; I was never nervous, I was never tense. I could see many riders, tense on their face; they wouldn't even give a smile to the photographers. I enjoyed that ride. It was beautiful, and I think God blessed every endurance rider in that we didn't have rain and we didn't have hot weather. It was perfect weather." The Netherlands' Carmen Romer and Tuff Enuff FA had also slowed down. Carmen had pushed the mare through loop 4 where she was still in 12th place, but the tumble they'd had, and the extra effort to catch up and stay up near the front, were taking their toll, and the mare was running out of steam. They left on loop 5 in 20th place, 49 minutes behind Maria and Nobby. 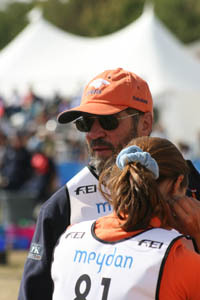 First to pulse down after arriving off loop five was Spain's Maria Alvarez and Nobby (in 3 minutes 15 seconds). A decent crowd had gathered around the trotting lanes to watch Nobby and the other front running horses trot out. A lot of breath-holding was going on, a lot of intense gazes and furrowed brows. 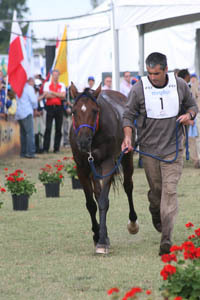 Nobby trotted along freely beside handler Stephane Chazel, looking as smooth and even as he had all day. He didn't look at all like he'd covered 142 km (88 miles), all at over 20 km/h (12.4 mi/h). The former World Champions would be leaving first onto the last loop, just seconds ahead of American Heather Reynolds and Ssamiam. Amazing to watch this obviously highly talented 9-year-old gelding who was running with the Big Dogs - this was only Ssamiam's second hundred mile ride! Heather and Jeremy Reynolds had gotten Ssamiam from Jan Worthington, who had gotten him from the same man Jan got her horse Golden Lightning. Jan gave Ssamiam up because he shied terribly and was rough to ride. "Heather knew all this when she bought him!" Jan said. A crowd lined the lane leading onto the course from the out timer. The first ten horses and riders all got a rousing cheer as they set off, Maria Alvarez and Nobby leading the way at a hand gallop. France's Jean-Philippe Frances on Hanaba du Bois. A minute later: Shaikh Mohammed and Ciel Oriental, 17 seconds ahead of his son Shaikh Hamdan and SAS Alexis, who was 7 seconds ahead of Qatar's Faleh Nasser Bughenaim on Amir. This pair had also advanced in placement steadily all day, from 30th to 12th to 7th. The small crowd then moved to the finish line to join the sizeable crowd already gathering and jostling for the best viewing spots. The winner was expected in just over a half hour. As riders coming off loop 5 approached the in timers, the crowd gave them big cheers, but all eyes were focused straight up the lane, from where the winner could come. Who would it be? It was a bit intriguing. 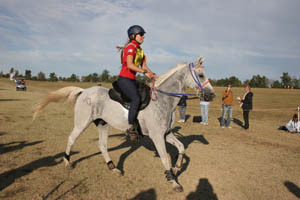 Maria Alvarez and her husband Jaume Punti-Dachs train horses for Shaikh Mohammed. Could she and Nobby beat her boss? Would she? There were rumors later that Jaume had spoken with Shaikh Mohammed about that very question, should the situation arise: should Maria hold back and let the Shaikh, Prime Minister and Vice President of the UAE, Ruler of Dubai, win? The answer (rumored) was that Shaikh Mohammed said, This is a competition, let the best horse win. But who would it be? Would Heather Reynolds and Ssamiam catch Maria and Nobby? Could Jean-Philippe Frances make up 4 minutes and catch them both? Would Shaikh Mohammed and his sons finish 1-2-3? Would it be a horse race, decided in the final sprint? And the first cry came up, "Here they come!" Elbows flew and bodies shoved to get the first glimpse of the winner: a solo horse and rider - Spain's Maria Alvarez Ponton and Nobby! Keeping with the tradition in the UAE of the winner crossing the finish line holding their country's flag, someone lobbed a Spanish flag at Maria as she cantered in. She wasn't expecting it and her hand fluttered to her face to protect it as the flag shot past her nose. 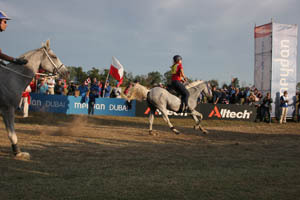 But Nobby cantered on without missing a beat, and Maria lifted her hand in salute, then pointed at her horse, as they cantered under the finish line by the packed, cheering press of people, cheering for the repeat World Endurance Champions. Maria said later it was a tough ride for Nobby, much harder than his win in Malaysia in 2008. "He was pressured the whole ride. I thought it was too fast, but, at the end, he was really strong." The winning time for the hundred miles was 7:35.44. Less than a minute later, Shaikh Mohammed and Ciel Oriental crossed the finish line in second to rousing cheers, followed 17 seconds later by his son Shaikh Hamdan on SAS Alexis. And then we waited. One minute... two minutes... where was Heather Reynolds and Ssamiam? Just over 3 minutes behind third place here came Heather and Ssamaim... along with Jean-Philippe Frances and Hanaba du Bois! A hundred yards out they started the race, sprinting for the finish line, asking for everything their horses had left. Heather and Ssamiam arrived first by two lengths - fourth place for the USA! Then came the big blow. Ssamiam was lame in the hind end in the final trot out. Eliminated. Jean-Philippe Frances and Hanaba du Bois were fourth. Heather and Ssamiam were off the results sheet. Why did she do it? Many people asked afterwards. Why race for fourth place? Because it was worth the chance of medalling - now that the US had no shot at a team medal, or another chance at an individual one. If one of the top three finishers were eliminated, Heather and Ssamaim and the USA had a chance at a medal. And she did it because she's a top competitor. Heather and Ssamiam gave it their all, and just came up short at the finish - less than 5 minutes, and a "mild but consistent" lameness, behind double World Endurance Champions Maria Alvarez and Nobby. That's not a bad thing for a young talented horse to have on his record. And no whining, no pointing fingers, nothing but praise from Heather afterwards. She's a top competitor with class. 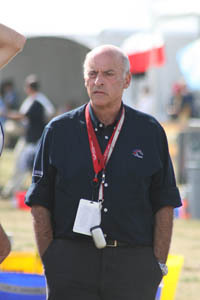 "I am proud as hell of what Sam did today. I really feel that the hind end lameness is due to his lack of 100 mile experience and that he has one hell of a bright future as a world class endurance horse. Sam is only 9 years old so I can look forward to many future World Championships with him in mind." I stayed at the finish line, so I missed the trot outs of the top five finishers. The final trot out, and completion, of second place Shaikh Mohammed's horse Ciel Oriental, has come to be highly controversial. Apparently a video of the final trot out of this horse was on the USEF website, then it was taken off shortly thereafter. 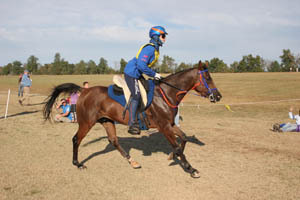 What is clear is the horse was asked for three trot outs. 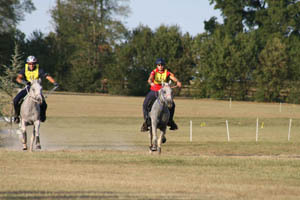 The first two were by a handler who the horse appeared to be mad at or afraid of, because he would not trot straight. I did see this from Ciel Oriental at two vet gates - head in the air, ears pinned, keeping his hind end out away from the handler, sometimes breaking into a canter. Some have said this is "hazing," which is not allowed in the rules, but I expect the exact definition of hazing is open to interpretation, and I have seen this in other Championship rides, and other National rides, not just this one. 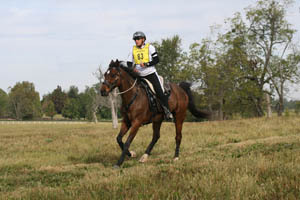 I have also seen consistently lame horses passed as "fit to continue," at vet gates and at the finish. I did not see any of the finisher's horses trot out here at the WEC, so I have no opinion either way. Ciel Oriental's third trot out was done by Shaikh Mohammed's son Shaihk Hamdan, and the horse trotted out straight and not upset, as can be seen on this blog and video from Canadian Trisha Dowling, which is inconclusive as to soundness from this angle. All I talked to agreed that, sadly, Heather Reynolds' horse Ssamiam was lame in his final trot out. 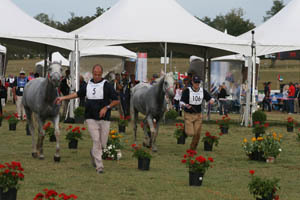 Three other horses vetted out lame at the finish: Qatar's Mazayha ridden by Mohammed Tahous Al-Nuaimi, Belgium's Alicia D Havenne Ewalraid ridden by Dominique Evrard, and New Zealand's Jenny Chandler on Lace and Fineness. 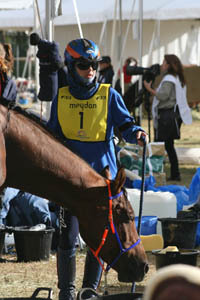 New Zealand's Northwinds Bradley McGregor, ridden by Debbie Worsfold had been eliminated at vet gate 1; and that left only Alison Higgins on her horse Twynham El Omar. They almost didn't make it, but it wasn't the horse who had an injury. It was Alison. During the 4th hold, her horse stepped on her thumb when she moved his food dish. "It almost sliced her thumb off," said Madonna Harris, the Kiwi Chef d'Equipe. "She passed out for two minutes. Later we wrapped her hand up, stuck her back on her horse, and sent her out!" Alison was 30 minutes late on her out time, and she had to ride the rest of the race with one hand. She ended up (bravely) finishing in 26th place. 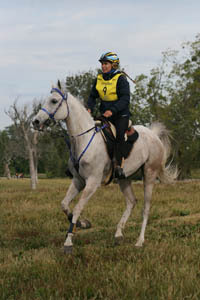 Penny Toft and the ever-steady Don were the only Australians to finish, in 44th place. 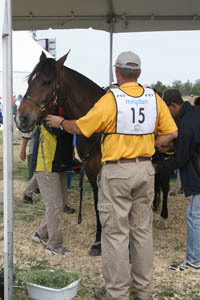 Matthew Sample and Tarrangower Crecendo had pulled at vet gate 5 for lameness, and Norbert Radny and West Coast Acheron had had been pulled at vet gate 3, for metabolics. 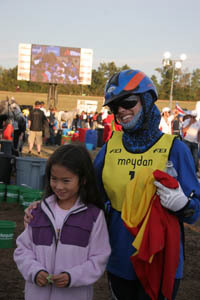 The Netherlands' Carmen Romer and Tuff Enuff FA finished 19th. They'd hoped for a higher finish, but Carmen's father Lei was still all smiles afterwards. Another great result of this year's World Endurance Championship was Germany. 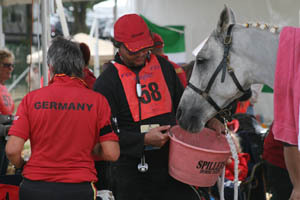 Germany finished all five of their riders, garnering Germany their first ever medal - Team Bronze (behind the UAE and France) - in a World Endurance Championship. Gabriela Forster and Priceless Gold finished 15th, Sabrina Arnold and Beau Ox 16th, Belinda Hitzler and Shagar 17th, Melanie Arnold and Shaika Bint Kheoma 22nd, and Petra Hattab and Prince Sharif 27th (as individuals). 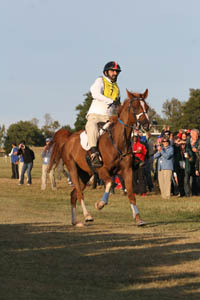 Deborah Reich and DJB Juniper were the USA's lone finishers, in 18th place. 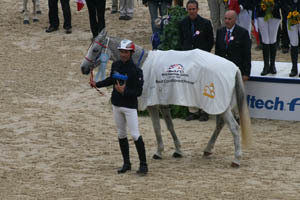 France not only won Team Silver, but 4th place Jean-Philippe Frances' great mare Hanaba du Bois won Best Condition the next morning. It had to be a pleasing result, though France's Chef d'Equipe Jean Louis LeClerc, and Jean-Philippe himself, were disappointed they did not have an individual Podium finish. It was Jean Louis LeClerc's last ride; after the WEC he is being removed as French Chef. And last to finish but not the least, was happy Japanese rider Chikako Nishiyama on Dameon PJ - Japan's lone finisher in Japan's first team appearance at a World Endurance Championship. It's been a short time since Japan started on an endurance quest, and with highly limited resources and horses. 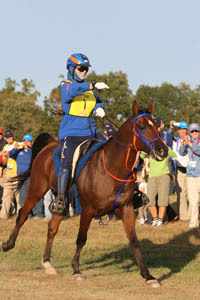 In 2007 Mr Seiichi Hasumi organized, with the help of Americans Steph and John Teeter of Endurance.net, and Tevis veterans Hal and Ann Hall, their first international 100-mile ride. 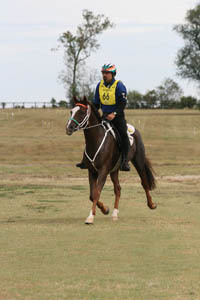 After failing to qualify himself for this year's WEC, Mr Hasumi served as Chef D'Equipe for the Japan team, and supplied 4 of the 5 horses ridden. 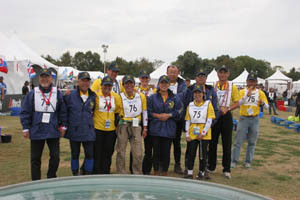 Japan came from a long way, and they have a long way to go, but Nishiyama's finish showed they are on their way on their quest to compete with the world's best. And that's what it's all about, isn't it?